You can probably tell from my lack of posting about it, but I didn't set any New Year Resolutions this year. I always make them and never actually make them happen. Instead, I have a few goals that I am attempting to achieve every day, hoping that a lack of labelling them will reduce the pressure a bit more. This post is based on something a little different: Take Back What's Yours. 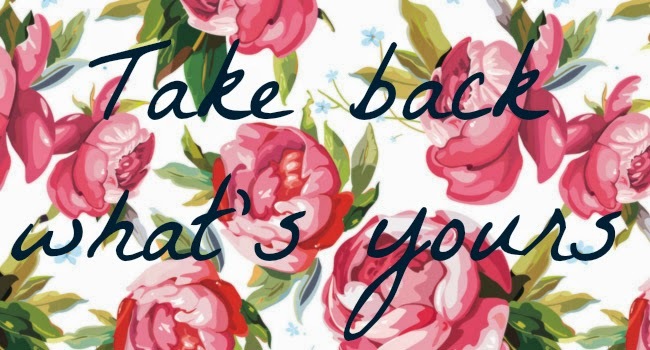 Chloe's Concept founded this campaign earlier this month as a fabby way to literally 'take back what was once yours', whatever it may be. Why not use the beginning of 2015 to aim to get something back that you may not even realize you lost. It's so easy to get caught up in day-to-day life that you don't even realise that sometimes you aren't living your life to it's fullest potential. When I first saw this campaign I thought it was an absolutely brilliant idea. Even as a person who believes that they do not have any anxiety or mental health issues, I really do think it is a good idea to promote understanding. Since studying at UBC I have seen just how little awareness and help there is for people in the UK who are struggling with mental health issues (although it is improving) and that it certainly is possible to give a lot more support than I have seen given in the past. We really need to be more open and talk about these sorts of issues without feeling weighed down by the negative connotations sometimes applied. They affect people in so many different ways and without them even realizing. I aim to 'take back' my freedom and not let studying and grades dictate my life. What do you aim to take back? Also check out #takebackwhatsyours for more blog posts and information. Now, time for me to get back to my 3 lab reports, 2 lab preps, problem set and research paper! Ahh thanks for tagging me! I've seen this campaign going around and I think it's brilliant - now I need to think of what I want to 'take back' :) I think taking back your freedom from studying is a fab idea and I hope it brings you lots of fun! No problem lovely! Thank you! This is such a fantastic idea - I couldn't help but do it! It's so lovely isn't it! Love Chloe's campaign, I'll definitely be getting involved soon! I hope we'll find a balance between the sleepless nights studying and the sleepless nights wandering around thinking about random things or drinking. I'm sure you will be just fine :). Oh Lulu, what are you doing here? I'm definitely getting better and taking a hold of that yolo pass fail mentality. Maybe I should listen to more reggae?